She was having problems between her two boys, Lachlan (8) & Aiden (4). She’s a RN and works part time. Her husband works full time as a company director. Above the kids fighting her priority was the aggression towards herself and between the kids. This photo is the parenting plan we drew up together in one of our sessions. The words in red in the top right corner are her underlying family values. 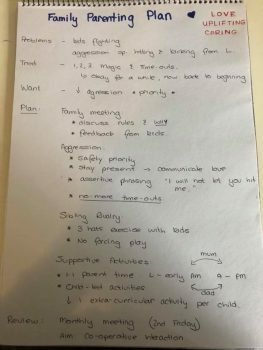 We drew this up together to give her and her husband a process to manage the behaviour. They had tried other processes but they had limited success. * 3 hats coaching exercise - a perspective based exercise for conflict management. She and her husband created the plan and acted upon it. They kept reviewing and tweaking as time went on. Her 4 year olds behaviour improved and aggression decreased. They also became happier and were able to weather the ups and downs better. She and her husband committed to regularly reviewing the plan and including their children in the decision making process. I heard from her last week and she reported that "things are much more settled and I haven't been hit by A in over 3 weeks"